Are You Running out of Things to do This Summer? We Will Help You Get Unbored. It’s the time of the year that everybody waits for all winter long. Finally we are able to sit outside again without getting frost bites, wear those shorts that have been laying in your closet for almost a year, and do more fun stuff. I always feel like there is so much more to do in the summer than in the winter. That’s why it’s my favorite time of the year. I constantly find new activities and sometimes have to push some off to the next summer. For others, the summer is much too long especially when they are on school break and they just don’t even know what to do with themselves anymore. That’s where I thought you might appreciate some ideas. If you live in an area that is generally extremely hot in the summer have some fun in the water. If you are not so fortunate to live on the coast turn on your garden hose or buy attachable sprinkler. This is especially a fun way to entertain kids. Have a water fight in your backyard. Buy lots of water balloons, invite some friends and splash them. This might sound silly to grownups but if you combine it with a grill party and some booze I guarantee you it will be a blast. Build your own slip-and-slide. Another one of those ideas you might think only children can enjoy but you haven’t been on an adult slip and slide then. Just make sure its long, maybe downhill, and you use some soap. The more slippery the better. You have never been camping? Now is the time to go explore the wilderness. There are many spots for camping, go on google and find out about camping spots in your area. I personally enjoy small, quiet camping spots that not many people know about. If you are a hiker you can even hike up a local mountain and set tent on top of it. Just make sure you follow camp regulations. Road trips can be fun when done with the right group of people. You can either, plan ahead and figure out exactly where you are heading, or if you are very adventures you can just drive and let the roads take you places you never knew existed. Ever heard of rolling down a hill in a giant plastic ball? Lots of people look at me with a big question mark when I ask if they have ever been zorbing. If you go online you might be able to find a place near you that does it. I promise you it is a blast. Another of those activities that isn’t too popular but extremely fun and affordable. There are hundreds of disc golf spots across the States, all you have to do is buy some discs, which are relatively cheap and find a course near you. It’s very similar to Frisbee except the discs are a lot heavier and you are aiming for a metal basket. It’s also something you can do over and over again without getting bored because you can visit lots of different courses. 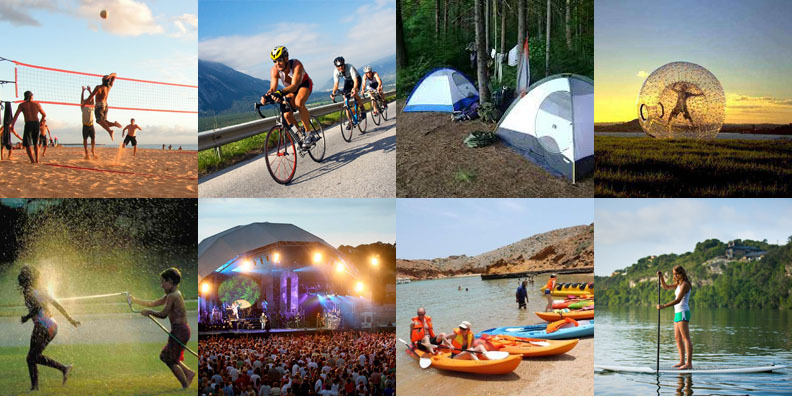 Anywhere you live, towns and cities offer events, not only in the summer but year round. Personally, I think summer events are especially nice because you can be outside. Some of them might even be free. Check your local newspaper, read signs, and keep your eyes and ears open. I have had the pleasure to enjoy lots of free concerts because I always read through local flyers and newspapers. Are you bored of sitting around go do some sport. There are a variety of outdoor sports, if you don’t like working out inside a gym during the summer. Some states have local leagues you can join. Go out for a run and sign up for a little marathon. Marathons become more and more popular and organizations come up with creative ways to make a run actually be fun, for those who don’t really like to run. You don’t necessarily need the ocean to do paddle boarding. A lake is the perfect place for it because the water is nice and calm. Grab some friends and find a place that rents paddle boards. If you are in to it, you can maybe even buy your own and take it wherever you want. You don’t know what to do anymore? Now is the best time to learn a new hobby. Think about something that you always wanted to try out and do it. There are so many things; learn an instrument, learn a new sport, go rock climbing, try surfing, paint, acquire new skills. This is when you should do the things you always complain, not finding time for. If you live near a big city, go visit it. Cities are the best place to end your boredom. You can walk around, visit museums, find new restaurants, go shopping, go dancing, and meet new people. Cities are fun places if you know how to take advantage of them. There is absolutely no reason to be bored in the summer and if you still are, you are doing something wrong. Every year I am overwhelmed by the amount of activities live has to offer. There is no reason to sit at home when it’s nice out, unless you don’t like the summer.